State regulators have signed off on CHI Franciscan Health’s plan to add 32 beds to St. Anthony hospital in Gig Harbor. The Department of Health conditionally approved a certificate of need for the expansion on Nov. 29, according to documents posted online. The $15.6 million project will build out the unfinished fifth floor of the hospital, bringing St. Anthony’s licensed bed count to 112. CHI Franciscan proposed the additional beds to meet growing demand for services. The facility is frequently at full capacity, resulting in longer wait times and patient transfers to St. Joseph Medical Center in Tacoma. “Building out St. Anthony will allow us to afford better care for our patients in the greater Gig Harbor community, with room to accommodate more patients with increased access to local services,” Dr. Lance Bear, MD, chief of surgery at St. Anthony, said in a news release. The new beds are expected to open in early 2018. This post was updated to include information from a Wednesday news release. Harrison Medical Center earned an award last week recognizing its success in improving patient safety. The Washington State Hospital Association honored Harrison with a 2016 Achieving Best Care Award for attaining high scores in reducing patient harm, according to a news release from CHI Franciscan Health. The award recognizes sustained improvements in five categories: infection, falls, early elective deliveries, sepsis and pressure ulcers. “The safety of our patients is paramount to providing high quality medical care and ensuring our patients get back to their daily lives as quickly as possible,” CHI Franciscan Peninsula region President David Schultz said in the release. You can find detailed quality scores for Harrison Medical Center here. An agreement has been reached that will keep Harrison Medical Center “in-network” for First Choice Health customers. The hospital and insurance carrier announced a three-year contract extension on Sept. 28. Negotiations had hit a sticking point late last summer, with the contract set to terminate Sept. 1. A temporary extension gave the two sides an additional month to negotiate. About 1,300 Harrison patients are covered by First Choice. Tuesday’s Kitsap Business Forum focused on changes in health care. 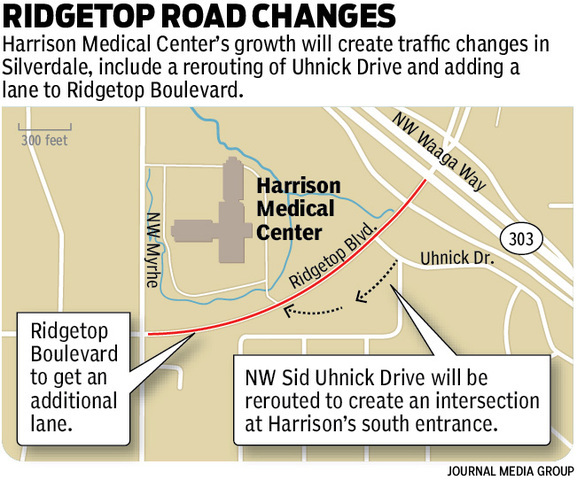 One of the biggest changes locally is of course the impending consolidation of Harrison Medical Center’s acute care services in Silverdale. And one of the questions arising from that move is how large a presence Harrison will maintain in Bremerton. Harrison (and St. Anthony) President David Schultz joined a six-member health care panel at the forum. He fielded a couple of questions about the hospital relocation during the morning conversation. Schultz was asked what the impact Harrison’s move will have on the ability for seniors, students and low income residents of Bremerton to access health care. He began his answer by noting only 14 percent of Harrison’s inpatient visits originate in Bremerton. “We have a lot more outpatient visits coming out of Bremerton than we do inpatients, so we’re really going to focus on the development of an ambulatory center,” Schultz said. “We’re going to have an ambulatory facility that focuses on primary care, urgent care, we’re going to have imaging, lab, we’re going to have the ability to have specialists rotating into the clinic. Shultz’s statement was the most detailed description we’ve heard of a future Harrison clinic in Bremerton. It remains to be seen what will become of Harrison’s East Bremerton hospital building. That topic wasn’t raised at the forum. Harrison convened an advisory task force to help guide its plans in Bremerton. The task force made its recommendations to the Harrison board in March, but the recommendations weren’t made public. The board is expected to make a decision later this year. 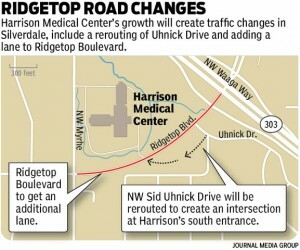 At the forum, Schultz was also asked about what effect Harrison’s Silverdale expansion will have on traffic. He discussed the intersection and road improvements Harrison is committed to funding (we detailed those recently) and said the hospital is coordinating with Kitsap Transit on a possible new transfer station. Harrison Medical Center will fall out of network with insurer First Choice Health if the two sides can’t agree on a new contract by Sept. 1. Bob Hinman, First Choice vice president for network management, said contract negotiations with Harrison have reached an impasse. First Choice believes reimbursement rates Harrison receives under the current contract are unfairly high, Hinman said. He was hopeful talks would continue. “I think that’s everyone’s hope we could come to agreement on appropriate terms,” he said. Hinman said First Choice has roughly 3,000 customers in Harrison’s market, and has included the hospital in its network since the 1990s. The insurer sent a notice to clients warning them the contract with Harrison may terminate in September. If Harrison is dropped from the provider network, First Choice customers will have to pay much higher out-of-pocket costs to access services at the hospital. The contract in jeopardy only covers Harrison Medical Center. Harrison HealthPartners physicians have a separate contract with First Choice, Hinman said. 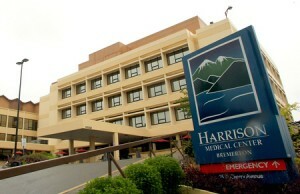 Representatives of CHI Franciscan Health, Harrison’s parent company, remained confident an agreement would be reached. “We are in active contract discussions with First Choice Health and anticipate to have a resolution before the September 1 deadline,” CHI Franciscan spokesman Shawn Jennison said in a statement. Harrison has had rocky relations with insurance carriers over the past few years. A contract between the hospital and UnitedHealthcare terminated in December 2013. 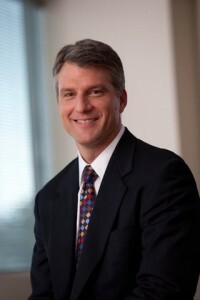 Harrison rejoined United’s network in April 2015. Harrison and Regence BlueShield failed to renew a contract in August 2014, prompting widespread outcry among Kitsap customers. Regence and Harrison signed a new agreement in February 2015. First Choice Health is a Seattle-based health care company owned by physicians and hospitals. If you have insurance through First Choice I would love to hear from you. Drop me an email at tad.sooter@kitsapsun.com or leave a comment below. Harrison Medical Center in Bremerton was one of 11 Washington hospitals to earn an “A” grade for patient safety in the Leapfrog Group’s latest Hospital Safety Score rankings. This was the second straight year Harrison Bremerton earned an A grade. 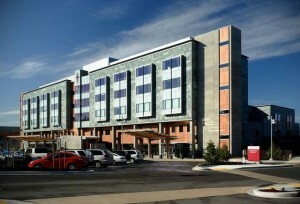 The hospital earned B grades in 2013 and 2012. The grades rate how well hospitals protect patients from injuries, accidents and infections. “Receiving an ‘A’ rating reflects directly on Harrison’s tremendous effort in providing the best and safest quality of care for our patients,” Harrison President David Schultz said in the release. Harrison in Silverdale was assigned a B grade in the spring 2015 ratings. Harrison Silverdale also scored a B in 2014, improving from C grades in 2013 and 2012. Leapfrog Group assigned ratings to about 2,500 hospitals nationwide in April. About 31 percent earned A grades. Leapfrog Group is a national nonprofit hospital watchdog organization. You can explore Harrison’s Hospital Safety Score rating in detail here. The Washington State Hospital Association also maintains detailed hospital quality page for Harrison. 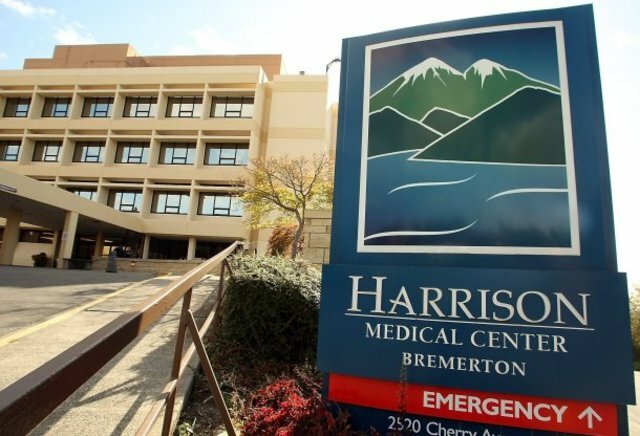 A task force is meeting to discuss what medical services Harrison Medical Center should maintain in Bremerton after it moves its main hospital campus to Silverdale. The group will also study options for repurposing the 1965 East Bremerton hospital. Harrison convened the “Bremerton Community Health Care Advisory Group” in September. The committee will meet monthly between October and March. After the six-month study period, the group will present a prioritized list of recommendations to the Harrison board. “CHI Franciscan Health believes this is an important endeavor to solicit community support and feedback in our planning process,” spokesman Scott Thompson said in a statement provided to the Kitsap Sun. CHI Franciscan is the parent company of Harrison. Bremerton Mayor Patty Lent said she is part of the task force. The need for an urgent care clinic in Bremerton is already being discussed by city leaders. The Doctors Clinic recently announced it will relocate its Bremerton practices, including urgent care, to Silverdale. You can let us know what health care services you think are most vital to Bremerton by leaving a comment below. Follow Kitsap Sun business reporter Tad Sooter on Twitter at @tsooter. Contact him at tad.sooter@kitsapsun.com or leave a comment below.